Mount Joy’s Amtrak train station has been in the process of getting a facelift! For this project, Bass has furnished, fabricated, and is currently erecting all structural steel and miscellaneous metal portions of this project. The upgrades and additions include two high-level covered boarding platforms, two enclosed elevator and stair towers for access between street level and platform levels, new street level parking arrangements, ADA accessibility, improved lighting fixtures, and bridge modifications which include a pedestrian overpass with a cantilevered canopy between the east and westbound platforms. This project is planned for completion in 2019. Build with Bass - Contact Us Here! May 4th, 2018, the Wellspan Health and Surgery Center project in Hanover, PA was successfully topped off with the last piece of steel to signify structural completion; a sure milestone of the project. The beam was signed by Wellspan physicians, leaders, and staff members, in addition to community leaders prior to the top off on the facility’s main entranceway. 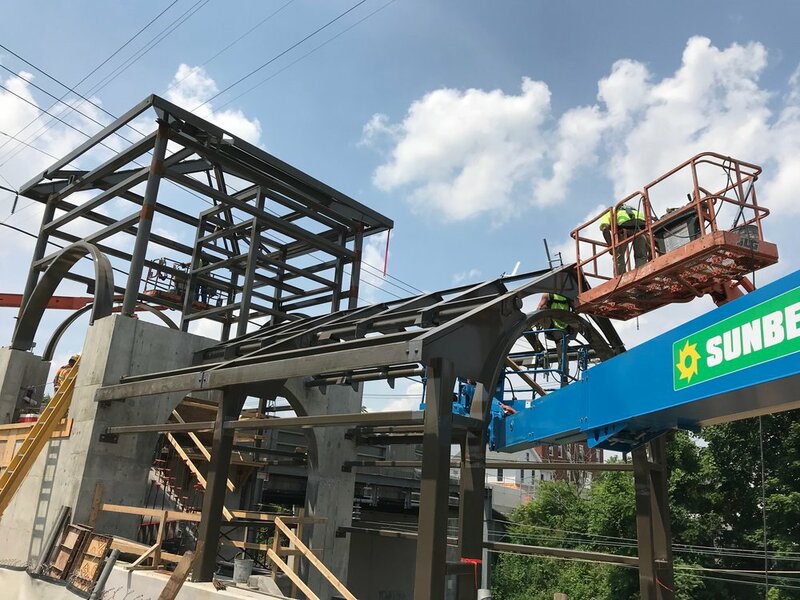 Bass worked with Stewart Amos Steel for the structural steel installation portion of this project which consisted of erecting 650 tons of steel per AISC Code of Standard Practice. Our hardworking field crew met critical deadlines and worked through various weather conditions in order to successfully complete the project. The health center, located in Penn Township, York County, will feature an outpatient surgery suite, lab and imaging services, and primary care and speciality physician offices. Wellspan Hanover Health is planned to open Spring 2019. Bass was proud to partner with Pneu-Mech Systems Mfg. for an oven system rebuild project for mutual customer, Transwall. The oven system was part of Transwall's paint finishing line at the West Chester, PA facility. Pneu-Mech handled the oven install portion of the project while Bass managed the wiring and controls. Bass is working with ECI Construction on a 22 ton structural steel project for Frederick County's new multi-million dollar Middletown fire station. Although the bulk of the building is a pre-engineered structure, Bass is fabricating and installing all interior structural and miscellaneous metals pieces for this project which includes beams, columns, trusses, miscellaneous framing, steel joists, floor deck, stairs with railings, and bollards. The active fire station in Middletown, Maryland has been in use since 1950 and has since outgrown the capacity of the station. The 18,000 square foot new building will feature enough area to house an aerial ladder truck and will offer four bunks and locker rooms to support overnight staffing which will lead to faster response time with calls. The new fire station is expected to open Spring of 2018. After being underwater since the Holtwood Dam was built back in 1910, it was time for one of the dam's lower turbine guide bearings to become unsubmerged, cleaned up, and renewed. This is the second bearing renewal that Bass has done for the Holtwood Dam in the past year and a half. For this project, it was also contracted for Bass to provide final drawings for the bearing since the original prints were faded due to being so old. After re-drafting the drawings and upon receiving the large guide bearing, as pictured below, the bearing had to be taken apart and sent off for blasting in order to be cleaned up. After its' abrasive blast, the piece was sent back to Bass to get a fresh coat of primer and for the new machined pieces to be reassembled back into one unit. Take a peak at the before and after pictures below!